Park Avenue is one of the world’s most iconic thoroughfares, attracting exceptional commerce, culture, art and architecture. The benefits of the Living Avenue go far beyond the centerline, providing a vital link to the history of Park Avenue, while highlighting its current architectural masterpieces. 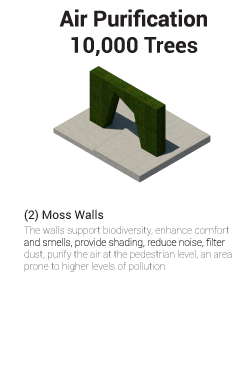 Using innovative technology, it provides clean air in the heart of the city, benefiting those who work nearby everyday or are simply passing through. 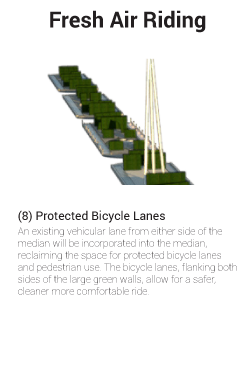 At street level, safe pedestrian and bike routes improve the use of the existing sidewalks and encourage mobility in the area at large. High above the street, visitors will experience one-of-a-kind views from a rare vantage point within the canyon of Park Avenue. The multiple layers of programmatic elements allow for phased implementation of the different components which will offer an ever-changing attraction. 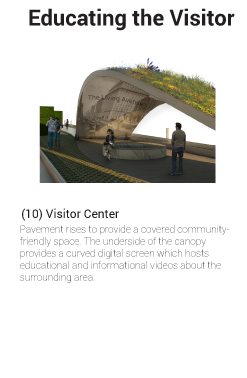 The proposed intervention will act as a catalyst for the Avenue, promoting social collaboration across public land and private buildings. 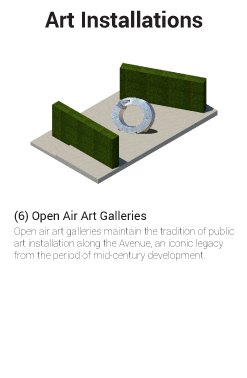 Park Avenue will become a green oasis, a fertile valley to the surrounding buildings.